ATA Cases conform to the Air Transport Association’s Specification 300 requirements. The material and manufacturing methods meet or exceed the ATA case specification. The tests involved with becoming ATA 300 compliant are conducted to ascertain if an ATA shipping case will withstand the rigors of being shipped a minimum of 100 times. These ATA Cases not only meet every requirement set forth by the ATA 300 specification guidelines, but all the ATA Shipping Cases exceed these standards. These ATA Shipping Cases deliver the maximum strength and durability with minimum weight. The hardware components and custom foam interiors also surpass every category requirement and the hardware is recessed to insure minimum damage during transit. 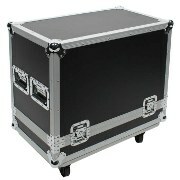 We have a full line of both plastic ATA Shipping Cases and custom fabricated ATA Cases including aluminum ATA Cases. The most important feature of an ATA shipping case is to have the hardware of the case protected from damage throughout the transportation system. This can be accomplished by having the hardware, such as latches and handles, recessed into the mold of the container. Alternatives to this would include attaching protective hardware covers to the case to keep them protected from damage. Molded ATA shipping cases typically come in 2 standard molding types: Ultra Heavy Duty Rotationally Molded Cases and Thermoformed (commonly called Vacuum Formed) cases. 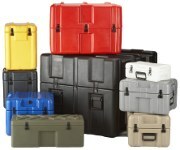 The Rotationally molded cases are some of the most rugged cases available on the market today and Ameripack specializes in supplying these cases to industry. Vacuum formed cases are more lightweight than a rotationally molded container and are often sufficient for repeated shipping of products. Aluminum ATA Shipping cases can be formed a number of ways, but they retain the common element of protecting the hardware on the case during multiple shipping locations. Aluminum cases are very lightweight and rugged. They may see more dings and dents in them then a molded container, but they are very difficult to crack or damage to expose the contents of the case. Custom Fabricated ATA cases can be made to any size and style that works for your product. Often called Road Cases, these tough cases are preferred by many traveling musicians and sports teams to protect their valuable equipment. Often constructed of plywood with a colored plastic laminate and tough metal edges, we also have lightweight plastic materials that can be used instead of wood to create a more lightweight, weather resistant ATA case that can ship worldwide without the issues that you may face with wooden cases. Contact us for more info about ATA 300 specifications or additional info.